The DLM: 100th Psalm–not particularly Christmas-y, but the girls have reminded me how much less has has memorized than they had at his age, and this seemed like a good place to start. Once a week or so we will do a song from SQUILT Christmas Carols volume two. We used volume one last year and really enjoyed it. 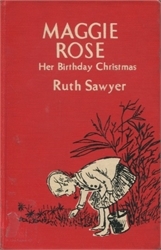 We’re starting out with Maggie Rose, Her Birthday Christmas by Ruth Sawyer as our Christmas chapter book. It’s fairly short, so I’m thinking that we’ll finish up the season with something else. Or perhaps we’ll just spend more time with our Christmas picture books once this one’s over. Lovely plans! I love everything I’ve seen by Ruth Sawyer, but haven’t seen that one. Sadly, our library has only two books by her. If you like that Christmas chapter book, let me know! Always looking for a new one. We’ve hit upon a few new-to-us titles this year which have been fun.